Hey everyone! 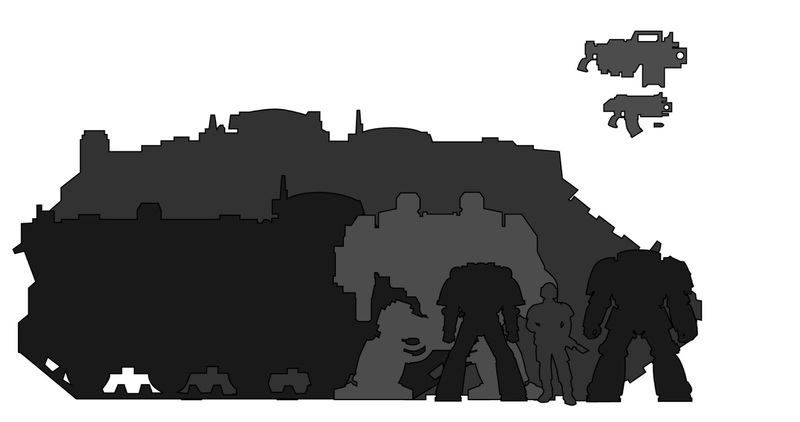 So I have seen a lot of discussions (debates) about what the actual sizes of things in the Warhammer 40k universe. Even when people agreed on the sizes, It was always expressed as the height in feet, meters, km, etc. That is great, but I want to be able to get the sense of scale as it is described in the novels (the way a normal human feels tiny next to a space marine). I thought the best way to do this (that was within my skill set) would be to make up a bunch of silhouettes of vehicles, weapons, and armour and place them next to each other. Eventually I want to make an animation where it starts zoomed in on a human, and slowly zooms out all the way to an imperial battlecruiser! I'm also planning to do some for xenos races as well. The way I have been determining the scale was by following the diagram in the back of the Imperial Armour books. 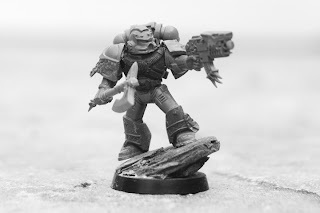 I'll have to use some other methods of finding the size of the things that aren't in there (xenos stuff) but that shouldn't be too hard if I use the models as a guide, or any other references that I can find. Since the models aren't to scale, I only use them as a starting point. So what do you think? 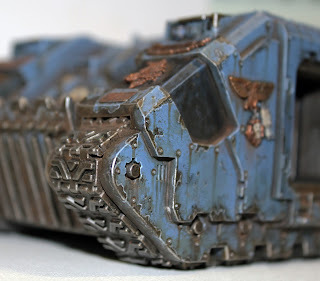 The Land Raider and Rhino actually look like they would be able to transport the amount of troops that the rules say, boltguns are huge, and a powerfist is the size of a human torso! This really helps me to get an idea of just how big things are in 40k. Make sure to view the photo full size, and let me know what you think, or anything specific you'd like to see sized up against everything. Thanks for reading! Hi everyone! I just wanted to show you a little update on the Deathwing. The picture above is my take on Belial. Like many of you, I really wan't a fan of the finecast Belial, and the deathwing box has so many great bits that It wasn't a problem at all to make my own. The model is just held together with stickey tack right now, and I had to photoshop the thunderhammer on there too. I didn't like the pose of the sergeant that came standard. It was just too stiff and static, so I swapped his legs with one of the others (it was much harder than you might think) to give a bit more movement to the model. Read on for more! I really liked the dark grey armour, and the multitude of conversions all packed into a nice little viking army. 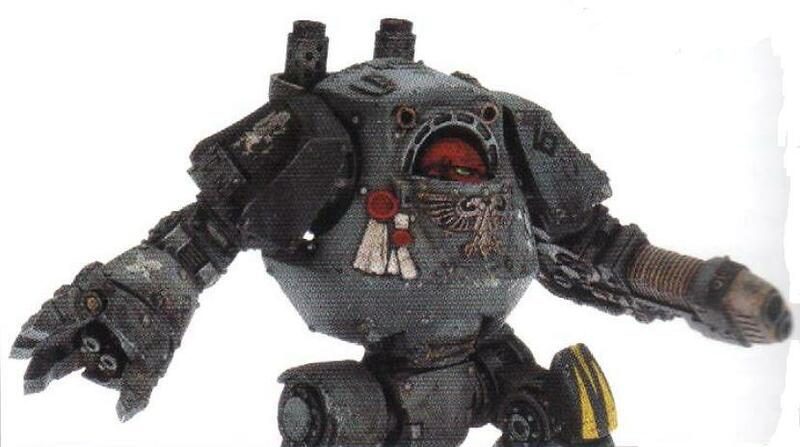 After that I took a look at their rules and found that they really enforced the raw power that I saw in the models. So needless to say, the vikings in space had won me over. And next thing I know, my brother got me a box of grey hunters and thunderwolf cavalry for Christmas! So now I had the problem of figuring out what my army was going to look like. Although the space wolves in the rulebook were the first to catch my attention, I wasn't fully in love with everything about it. I saw the picture of the space wolves contemptor and really liked the color scheme. So that was it. Dark grey with black shoulderpads and a touch of red every once in a while. I'm going to be avoiding the yellow, but the long fangs will probably have some white here and there. Every model is different, and he has written a backstory for each of them too! 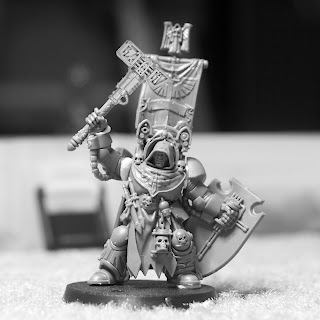 His color scheme is pretty close to what I'm looking for, but what really caught my eye was all of the incredible conversions. 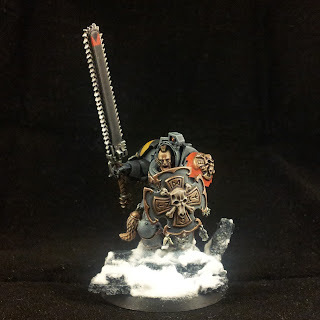 I knew that I wanted each and every one of my space wolves to be converted at least in some way. There will be no assembling straight out of the box for this army. 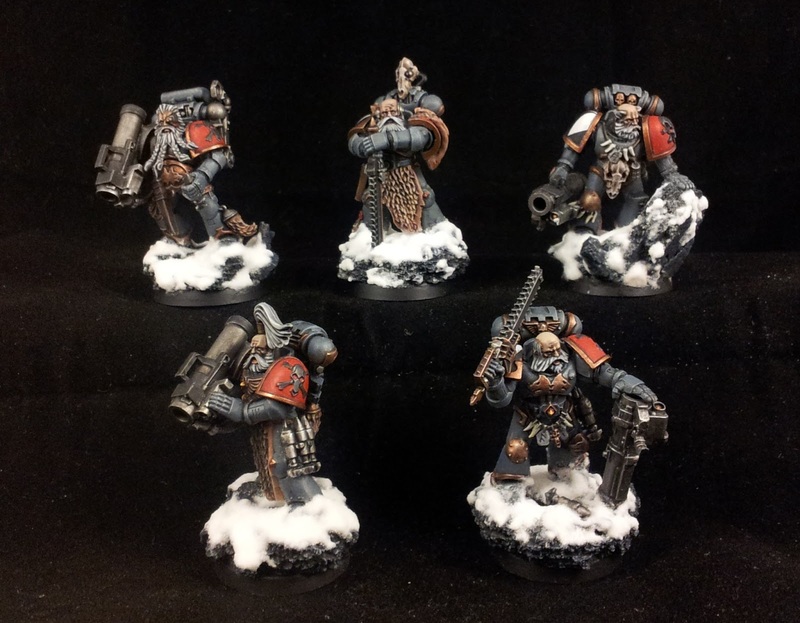 And it is really the perfect army to do this with because they come with so many extra bits, and the models are just demanding to have extra character built in. So what exactly am I planning for my army? 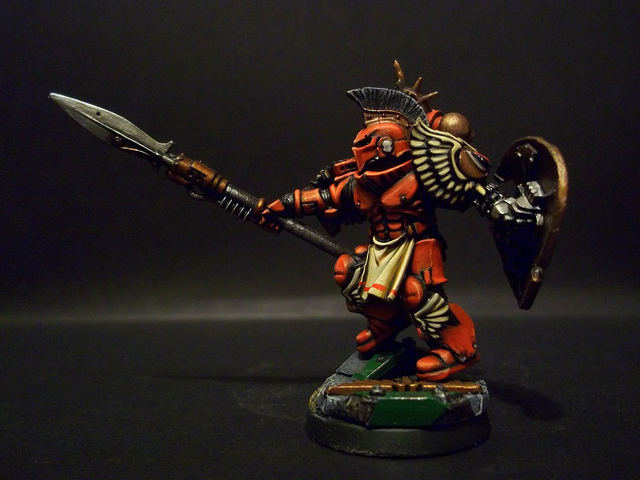 Well as I said before, the armour is going to be dark grey with dark red here and there. My current army is very clean, so I wanted to mix things up and make these guys look like they have been out in it for a long time. Their armour is going to be extremely worn and battle damaged like this land raider by John Beech. The details are going to be in a corroded bronze similar to the model above by Brandon Griffith. I'll be adding a bunch of details in greenstuff like these wolftooth decorations by Night Runner. I'm also thinking of adding some chainmail as well because that would look really cool and fit well with the viking theme. And to further the image of brutal warriors, there will be blood on all their weapons using Tamiya clear red as in this tutorial by Lonewolf. 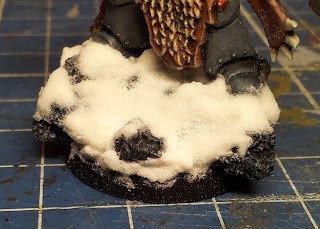 For the bases, I am definitely wanting to add some snow, and the method that I am liking the best is the one that Poingo uses in his tutorial using baking soda. But you need something to put the snow onto, and for that I am using pine bark as rocks which I learned from 3T Studios who have some incredible tutorials (don't be put off by the first picture, it's an example of what not to do). I will also be using some sculpey like I did with my Cultist Champion so I can add some runestones. So now, onto my stuff! 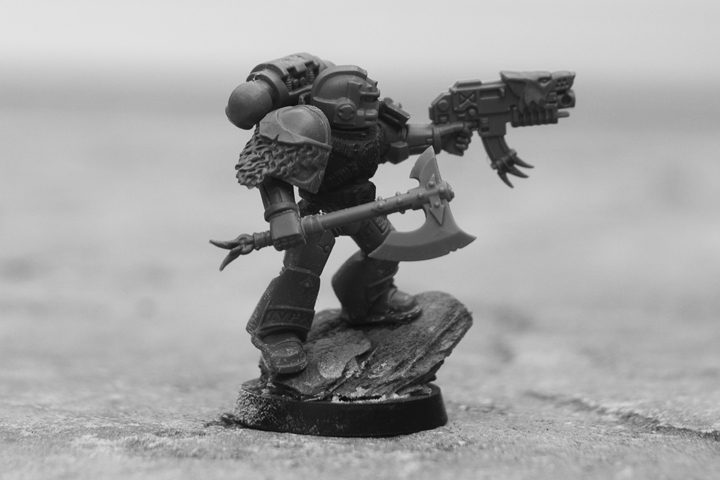 I got myself some spears and axes from the chaos marauder horsemen kit which I am using to give them some close combat weapons other than chainswords.You can see one of the axes that this guy is carrying. I put this picture in black and white so the bark on the base actually looks like rock. I love how all Grey Hunters have a close combat weapon, bolt pistol, and bolter. Not only for the extra attack, but also because it is much more interesting to make them models when the whole squad is holding different weapons. 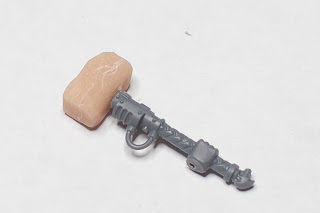 I also made this thunderhammer for the thunderwolf cavalry. The head of the hammer is made from super sculpey which I carved into a boxish shape. It's going to be painted up to look like the space wolf carved it himself out of stone. I'll probably carve some runes into it as well. One of the other thunderwolves is going to be throwing a spear with a few more strapped to his back. It seems like a spear would be a better weapon than a chainsword when you're sitting on the back of a 6' tall wolf. 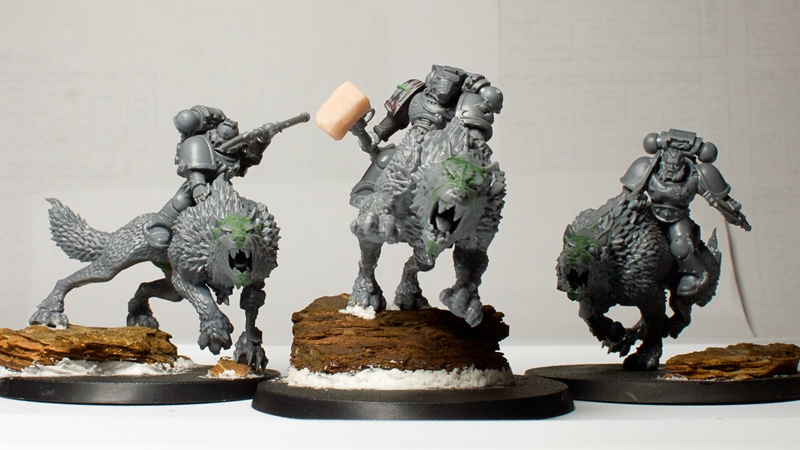 So that is the current direction of my space wolf army. Now that school is just about out I'll hopefully have some models converted and ready to paint soon. Thanks for reading! So what do you think? Kinda look like a terminator? I actually had a lot of fun trying to figure out how to make these, so i think I'll keep going. I think I'll try to make a Rhino next, and then maybe a Land Raider, and who knows what else! Thanks for reading! Well I am back again with another set of custom warlord traits! This time it is the Imperial Guard. As always, let me know if you have any ideas for improvements or replacements, or if there are any that are over/underpowered. Enjoy! In honor of (almost) reaching 10,000 views (Thanks everyone!) 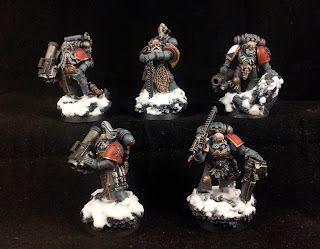 I am putting up an army list that I'm pretty excited about! 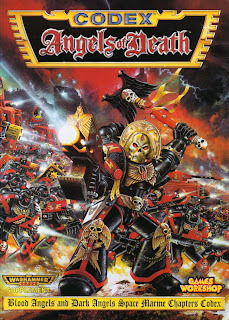 So first of all, I'd like to let you all know that the top three things about 40k that have fascinated me since the start are terminators, jump packs, and dreadnoughts, and the two armies that I have loved since the start are the Blood Angels, and the Dark Angels (and I've recently found that I also love the Space Wolves). 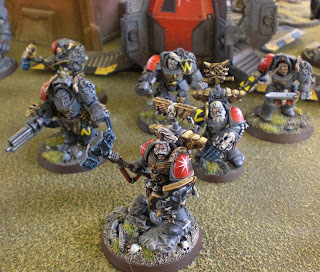 I've never used more than 5 terminators in an army, but between the Assault on Black Reach and Dark Vengeance starter boxes and the Assault Terminators that my wife and brother got me for my birthday last year I found that I had the makings of a nice Deathwing just in time for the new Dark Angels codex to come out. And when I saw the Deathwing Knighs models I knew that I would have to get myself one of those eventually. Well folks, eventually has arived! With the Deathwing Knights in the mail, I present to you my first draft of a deathwing list. Enjoy! Here is an army list that I have been playing around with for a while now. 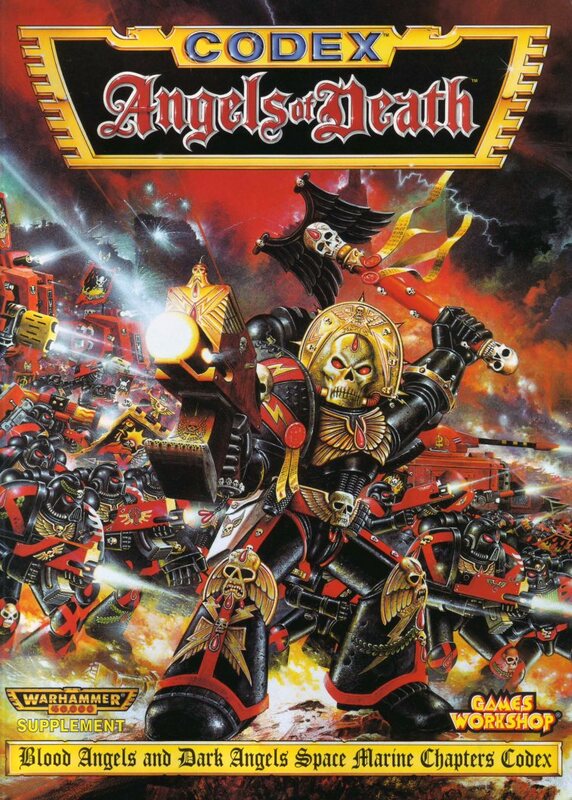 It includes a main force of jump pack Blood Angels, with Dark Angel allies. 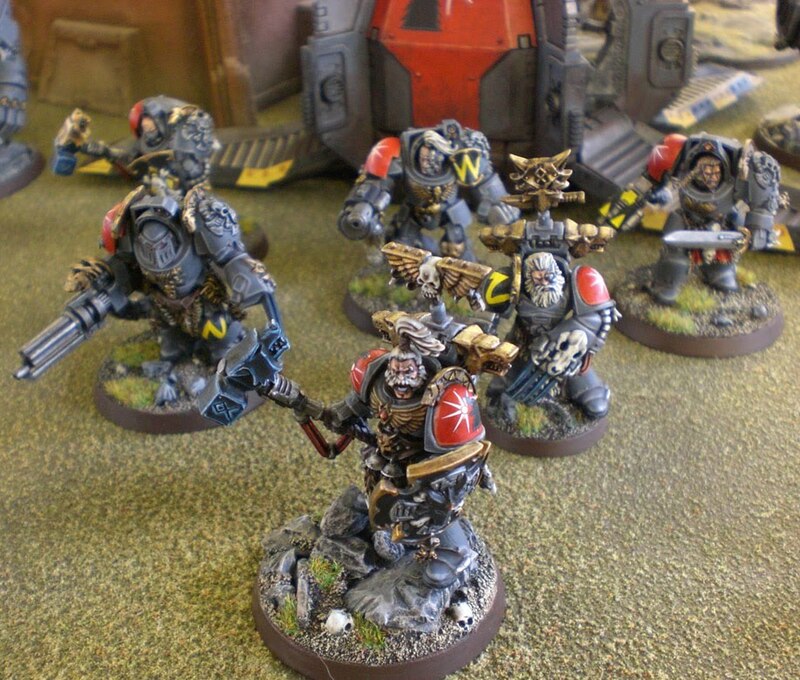 This army is designed to be a fun, varied army with a bunch of different element and units that I really like. I'm not sure how competitive it is, but since I'm not out to win any tournaments that isn't a bit deal (although I sure do like to beat my brother's Grey Knights). Let me know if you have any suggestions or comments! 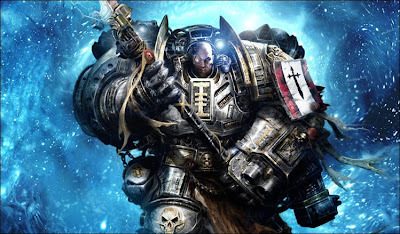 Here in part 2 I have the warlord traits made especially for the Grey Knights. 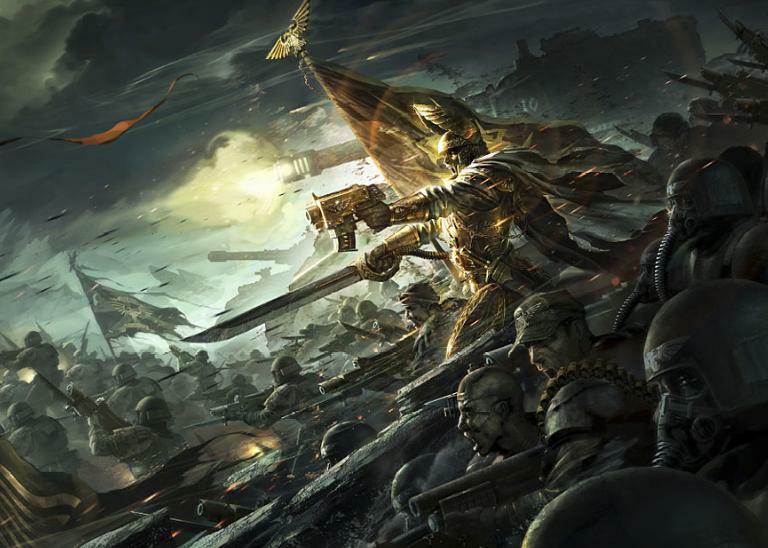 For those of you who missed the Blood Angels' warlord traits, here's a quick explanation of what this is. The new 6th edition codexes have interesting and fun warlord traits that are made to work well with the strategies of the army. But all the armies that still have pre-6th edition codexes have to use the main rulebook's warlord traits which more often than not are almost useless in your army (Master of offence for a gunline army, etc). So I decided to make up traits for the armies that haven't been updated yet for use in friendly games.